Axiomtek – a world-renowned leader relentlessly devoted in the research, development, and manufacture of series of innovative and reliable industrial computer products of high efficiency – is launching its new low power fanless embedded system, the eBOX625-312-FL. The slim-type embedded box PC is powered by the Intel® Celeron® processor N3350 or Intel® Pentium® processor quad-core N4200. It has one 204-pin DDR3L-1866 SO-DIMM socket for up to 8GB of memory. With wide operating temperatures and rich I/O interfaces, the rugged embedded box computer is well-suited for Industrial Internet of Things (IIoT), retail equipment, factory automation, and many more. "Axiomtek's eBOX625-312-FL offers great customer value with a combination of good computing performance, flexible connectivity options and effective pricing. It is designed with anti-vibration of up to 3Grms and a wide operating temperature range (with non-turbo mode) from -20°C to +65°C (-4°F to +149°F). Furthermore, this low power embedded system adopts an IP40-rated rugged aluminum extrusion and steel case, allowing it to withstand operations in harsh and hazardous environments," said Janney Lee, product manager of Product PM Division at Axiomtek. To satisfy a variety of embedded application needs, the eBOX625-312-FL comes with multiple I/O connectivity including two RS-232/422/485 ports, one RS-232 port, three USB 3.0 ports, two USB 2.0 ports, two Gigabit Ethernet ports, one audio, one VGA, and one lockable HDMI with a resolution of 4K ultra HD. Moreover, the fanless embedded box PC supports two full-size PCI Express Mini Card slots for WLAN/WWAN/mSATA modules and one SIM card socket. The system also includes one 2.5" SATA HDD and one mSATA for extensive storage needs. Additionally, it supports a user-friendly front-access AT/ATX switch, allowing the user to make adjustments with a single click. The extremely compact quad-core embedded platform supports a wide range 90 to 264V AC power input with an optional 12V 60W adapter and power cord. It runs on Windows® 10, Linux, and also supports Axiomtek’s exclusive AXView 2.0 software. The eBOX625-312-FL supports various mounting ways such as VESA mount, wall mount and DIN-rail mount by requests. Axiomtek's fanless embedded system, the eBOX625-312-FL, is now available for purchase. For more product information or pricing, please visit our global website at www.axiomtek.com or contact one of our sales representatives at info@axiomtek.com.tw. eDP-to-MIPI Dual-DSI Bridge Chipset brings 4K2K UHD to portables. 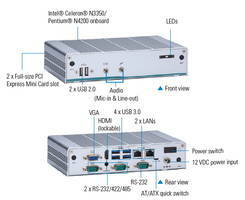 tBOX500-510-FL Fanless Embedded System is integrated with two 2.5 in. SATA drives. Embedded Wi-Fi Module features serial and SPI interfaces.